You’ve heard this before. It’s one of the most beloved quotes of our time. You may understand it on an intellectual level, and you’ve seen glimpses of its truth, but there’s only so much one can risk, right? I mean I shouldn’t risk security in order to follow an ambiguous dream, right? I’m not so sure anymore because the doors have started to open… wide. For the longest while now, I’ve been feeling an urge to take a different path in life. A voice from deep within has been asking me to start focusing more on healing and transformation work, namely around teaching self-compassion. As the years pass, the voice keeps getting louder. It seems the universe has been hearing this voice as well, and it’s done being subtle with it all. In September 2015, when the voice was basically screaming at me, I emailed the Centre for Mindful Self-compassion asking where I’d need to go to receive training to become a Mindful Self-compassion (MSC) teacher. I was willing to go wherever I needed to go as long as it matched my schedule. I knew they offered courses in the US, Australia and Germany, but I was holding on to the hope that they’d offer a course somewhere in Asia. The response I received back was an unexpected surprise. Apparently there was a trainer in Korea who could offer a course! I quickly emailed this trainer, SeoGwang Snim, and after a few exchanges, I discovered how much I was really starting to align with the universe. She said that if I started the MSC learning process, I’d most likely be able to attend the teacher training course scheduled for August 2016, a week before my semester starts. Talk about excellent timing! The first step toward applying for the August teacher training would be to do the eight-week introductory course. The only catch is that we’d need at least eight participants. I quickly wrote this message on my Facebook page. I am working on gathering people who would be interested taking an introductory course in Mindful Self-compassion (4 Saturdays in Seoul). This is a program based on the work of Christopher K. Germer, PhD — The Mindful Path to Self-Compassion and Self-Compassion by Kristin Neff, Ph.D. The trainer who would deliver this course, SeoGwang Sunim, http://www.centerformsc.org/user/434, said she would offer a program for English speakers if I can gather enough people. I am very excited about this and motivated to get this organized. If any of you are interested, or know anyone who might be, please contact me and/or pass this along. My intention in taking it is to move forward into becoming an MSC trainer (teacher). If this sounds like something you would be interested in as well, I would enjoy taking this journey with you. Here are details on MSC: http://www.centerformsc.org/Training Thank you for your time! The response was overwhelming. I couldn’t have imagined how much interest was out there. Unfortunately, not everyone was able to attend, but we had ten beautiful souls to get started. A month ago I put out a call for people interested in taking an introductory course in Mindful Self-compassion in Seoul. I’m excited to share that the course will start this Sunday (Nov. 1). For me, this has been an inspiring example of what we can accomplish when we follow our dreams (a.k.a. inner teacher <3 ). If anyone else would like to join, there is still time to sign up. Send me your email address and I’ll send you the details. 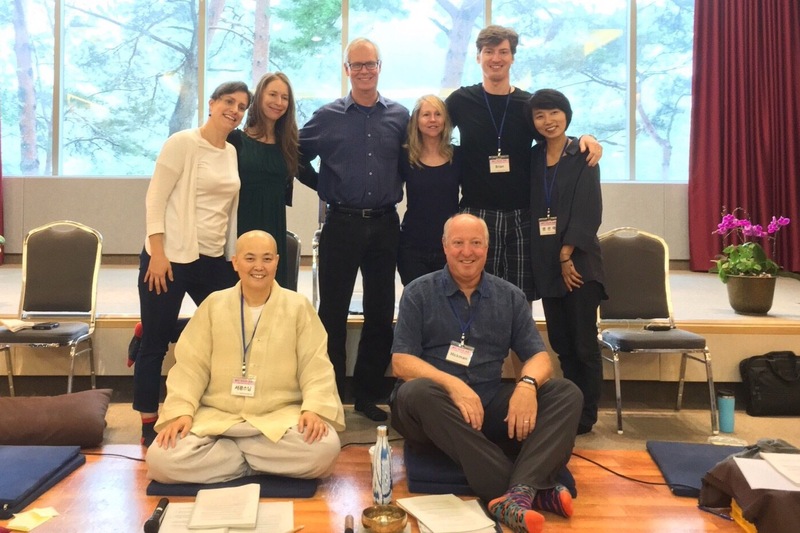 And so in November 2015 we embarked on the eight week journey (we combined the eight weeks into four) at the Institute of Korean Meditation and Psychotherapy in Seoul. Last August, just a week ago, three of the ten pictured above joined forty-six new participants to finish the first MSC teacher training course in Asia. We are all now officially an MSC teachers (in training)! And the doors keep opening. Our precious MSC sangha revealed so much more than I could have dreamed of. Together we revealed and healed. Through the kind, wise guidance of our teachers, Christopher Germer, Steven Hickman, SeoGwang Snim, and Gwon Seona, I gained a deeper understanding of how compassion truly works in this world, within me. And with the loving acceptance of my dear MSC sangha (see pictures below), I entered a safe space where I was able to stop intellectualizing compassion and instead resonate with the loving connected presence we all share. In the end, what I truly learned is that when you love yourself, so much more is available to you. This is the true bliss. This is how the doors start opening. * The next door to open includes the community Brian Somers, Nina Iscovitz, Tosca Braun and I are building where we will offer the 8-week MSC course in English in Korea. We have started the Mindful Self-compassion Korea Facebook Group and a MeetUp Group where you’ll be able to find out where our courses, either in English and Korean, will be held.